I met a beautiful farmer yesterday whose story I’ve been following with dismay for the last couple months. We walked around her paddocks admiring groups of healthy, happy pigs as she described her system for breeding, weaning, and feeding. Jo’s farm smells of nothing but fresh air, sounds of birdsong and the occasional curious grunt from a well-fed pig with nothing to fear, and is in a rolling green valley well covered in lush spring grass. In 2014, Jo Stritch of Happy Valley Free Range won Livestock Farmer of the Year. In 2015, Jo was ordered by her local council to cease farming. How could this happen? Because the Victorian planning scheme deems her operation ‘intensive’ due to more than 50% of the pigs’ nutritional needs being met by feed Jo imports onto the farm, and the Yarra Ranges has a ban on intensive production. A ban on intensive agriculture is surely a welcome reflection of community sentiments that are turning against intensive animal agriculture. But when a small pastured pig farm is defined as intensive, something is wrong. Let me unpack the issues. Clearly this applies to nearly all pig and poultry operations, no matter whether the animals are confined in sheds or out on the pastures. 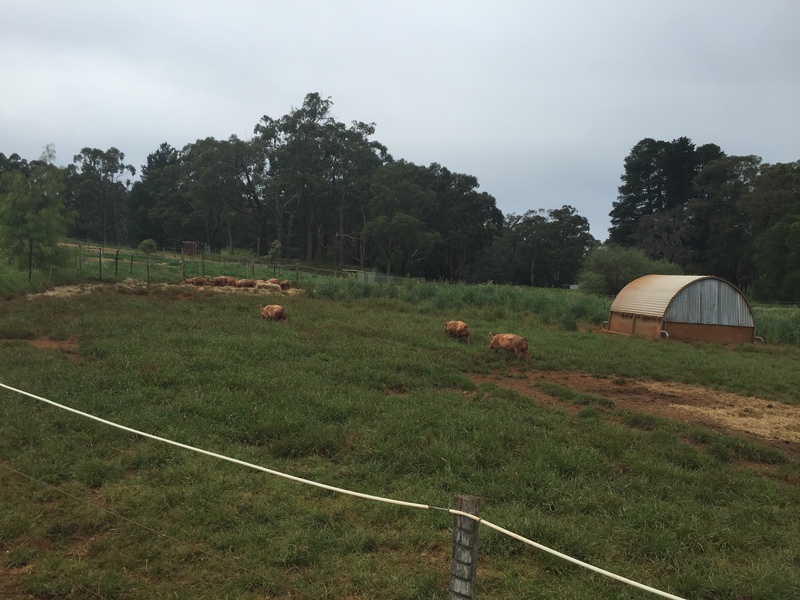 No matter whether the pastured pigs are on bare dirt or well-covered paddocks. It therefore also applies to many equestrian and dairy farms that import a lot of their animals’ feed. Oh, and cattle farms, even just those who feed hay to their cattle in the leanest months of winter and the dry end of summer. And to what purpose do we want to define these operations as ‘intensive’? In common parlance, most people consider animals that are confined and quite restricted in the extent to which they can move to be raised ‘intensively’. Pigs like Jo grows are not what the public thinks of as ‘intensive’. What does bringing in feed do in reality? It builds fertility. What happens if you bring in feed for more animals than the land can sustain? It sours. If you concentrate stock numbers, such as in intensive animal agriculture, you can overly nutrify and indeed toxify the soils. The ‘outdoor bred: raised indoors on straw’ production system for pigs have a practice of moving the ‘eco-sheds’ every two years and then not returning to that same spot for another two years to deal with the issues of souring. A system like Jo’s, where the pigs are rotated regularly and stocking densities are vastly lower, shouldn’t actually encounter this souring of the soil. The regenerative farming movement is constantly grappling not with letting soured soil recover, but rather how to continually regenerate and build fertility in the soil. One thing the neighbours who testified against Happy Valley commented on was ‘the condition of the paddocks’, which had improved since Jo decreased her stock numbers in November 2014. Free-range pig farmers talk a lot amongst ourselves about soil health and good coverage. And yet in the potato-growing region I’m in the paddocks are bare for months at a time, sprayed heavily with herbicide and fungicide so that nothing grows while they lay fallow. The so-called expert who gave evidence in the VCAT case against Happy Valley is an expert in intensive agriculture. ‘APL submitted that based on science it is not feasible for pigs to obtain most of their dietary requirements from pasture/forages alone.’ Right. Except for in nature. Pigs also don’t build houses anywhere except in fairy tales but the intensive industry would have you believe that it is difficult for pigs to survive outdoors. Thanks Tammi – these diaries are an amazing contribution. I notice towards the top of this post that you mention it was the local council that ordered the farm to shut down — do I take it that the central issue was where the farm was located? if so this seems to be similar to the local council ruling on the blackmore wagyu beef operations…. Hi Ronnie – in both cases it was a local council ruling, yes. However, in Blackmore’s case, the local council rejected a permit application for an intensive operation. I believe the state government has now overturned that ruling, though I am not 100% certain I have that right yet. In Happy Valley’s case, because the council bans intensive agriculture, Jo can’t even apply for the permit. So it seems to me that what needs to be addressed is the definition of intensive, which is part of the state planning scheme, if want want small-scale free-range farms to thrive. Hi Tam, Is there any direction in which the legislators are being pointed to with regards of a more appropriate definition of “intensive” ? I have found this a remarkable tree. It’s being grown in Africa for malnutrition, but as we know westerners are malnourished and Australian soils contain no Boron, except in Carnarvon. Fortunately, the moringa tree has boron so we get all the nutrients from this one tree, the only tree on the planet with so much extraordinary nutrition.